Sanjmed Medical Equipment Distributors have a complete range of hospital furniture manufactured in epoxy coated, unpolished stainless steel as well as polished stainless steel finish. A wide range of essential hospital furniture required for any start-up general practitioner can also be found at Sanjmed Medical Equipment Distributors. Examination couch and much more. Our hospitable bed range has many options to choose from such as an Adult Cot Bed and Children Cot Bed which have drop down cot sides. The Juvenile Cot Bed has fixed cot sides. Hi-Lo Beds come with either a 2 section or 4 section gas assisted backrest. The 3 Section Fixed Height Bed has manual fowler positions and the Old Age Home Bed has a melamine oak panel. Standard Hospital Beds are available with or without a manual backrest. Other speciality beds include Obstetric/Delivery Beds, Recovery Beds, Patient Trolleys, Gynae Couches and Examination Couches. You can count on us for any type of hospital bed you may need. Other hospital furniture that we supply includes the Double Step with a wooden non-slip rubber top, Overbed/Cardiac Table, and Overbed Table Hi-Lo with melamine oak top. Plus Mobile Bassinet, Soiled Linen Receiver, Drug Cabinets, and Bedside Lockers. 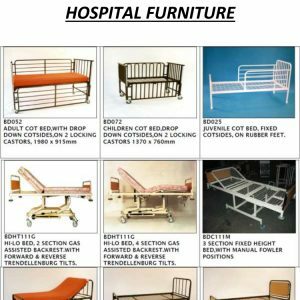 In addition, we also have a range of specialty hospital furniture such as Bedside Screen & Curtains, Oxygen Cylinder Stands, Various Trolleys, Mobile Bedpan & Urinal Stand, as well as Bucket and Bowl Stands. For a more comprehensive list, please click the link below to view our range. For more information or to get a quote, feel free to contact us.